The Reuters Institute for the Study of Journalism is a globally focused research centre at the University of Oxford. They track the world’s media, its trends, developments, and forecasts. They connect relevant and engaging academic research with journalistic practice, linking rigorous analysis with practical experience. Established in 2006, they’re based at the Department of Politics and International Relations at the University of Oxford. Develop your academic understanding of the media industry, improve your knowledge and focus on an in-depth piece of research away from the pressure of tight deadlines. The media industry is undergoing profound change, and evolving practice mean agile thinking and a deep understanding of the major issues and challenges are key to industry success. Awards may include travel expenses (including air travel economy class) and a modest living allowance. This arrangement is subject to variation. Spouses and partners (including with dependents) are welcome but under no circumstances will the Fellowship Programme pay the travel or living costs of visiting spouses or dependents. Journalists on Fellowships from the Thomson Reuters Foundation, Mona Megalli, Wincott and Google will receive a monthly stipend of £2,000 for their living costs during their stay in Oxford, as well as covering travel costs within reason. Journalists may also arrange their own funding, but they should then approach the Director of the Programme, in the first instance before making a formal application. Self- funded fellows may apply at any time. 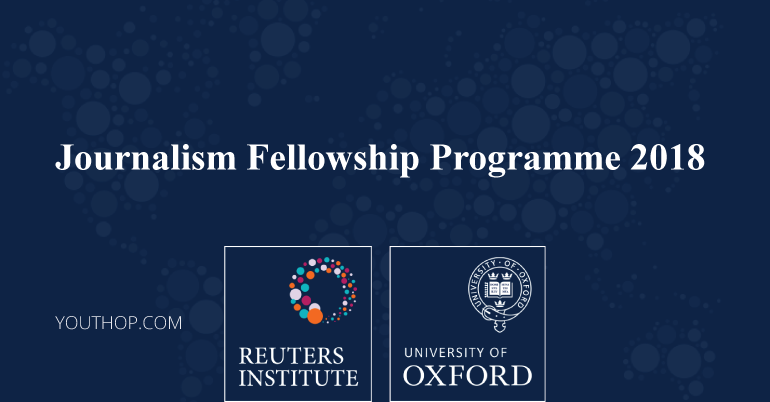 The Reuters Institute for the Study of Journalism offers fully funded Fellowships to well established mid-career journalists from throughout the world. Applicants must have a minimum of five years’ experience in any branch of journalism and demonstrate sufficient proficiency in English to be able to participate fully in the life of the Programme and write a research paper in English of publishable quality. They do accept applications from freelance journalists, however, they must be working journalists who plan to work as journalists after the Fellowship. Unfortunately, they cannot accept applicants with no recent experience or only limited experience of working as a journalist or who have no intention of returning to work as journalists. The Fellowship is a full-time programme and we expect all Fellows to commit to the numerous academic and social activities of the Reuters Institute.